The Giant Weaver was formally named by George Robert Gray, an English zoologist and author. The Giant Weaver was collected by Louis Fraser, a British zoologist and collector. Fraser participated in the British Royal Naval Expedition to the Niger River in 1841-42 as one of five civilian scientists appointed to the expedition. Fraser became ill on board and was considered too unfit to continue with the expedition when it returned to the West African mainland in March 1842. He made his own way to Bioko, reaching it by 15 May 1842, after spending six weeks along the Gulf of Guinea in other naval vessels. He began a collection of birds, mammals, fish and crustaceans. The months spent in the Gulf of Guinea from March to July were profitable (Moore 2001), and he collected the Giant Weaver on St Tome Island. In 1847, the British Museum purchased 64 bird skins from Fraser, including the Giant Weaver. 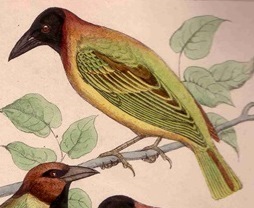 Fraser published descriptions of some of his new birds in 1842, but named his weaver as Ploceus collaris. This name had already been used by Vieillot for a subspecies of the Village Weaver and was thus not a valid naming. Gray realised this and provided a new name in his list of genera and species in 1844. The first illustration of a Giant Weaver is a colour painting in Fraser 1849. The next illustration is by Reichenbach (1863), also of an adult male. Hyphantornis grandis	Gray 1844	Gen. Birds, 2, p. of Ploceinae = Ploceus collaris Fraser nec Vieillot (1842, PZSL, p.142);	Sao Tome. grandis - Latin: large, great. 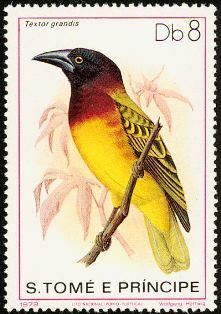 St. Thomas' Weaver Bird (Fraser 1849). St. Thomas' Weaver Bird, The great Weawer. 1842, between March to July. One specimen is known to be in the British Museum (BM 1847.1.18.3) together with 3 more syntypes (Warren 1971). Identification. The Giant Weaver Ploceus grandis is a large weaver, the male's bill being larger than that of any other weaver. 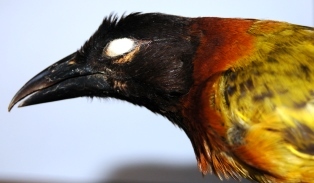 The male has a black head surrounded by chestnut, and resembles the Village Weaver, but the Giant Weaver has a pale eye (rather than red) and plain back (rather than streaked). 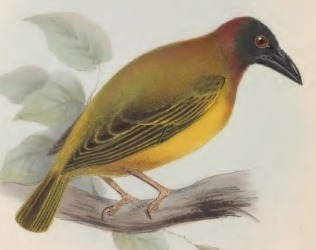 The female Giant Weaver is dull coloured, and differs from the Village Weaver in having a pale eye, no supercilium, and buff breast (not yellow). In flight the Giant Weaver appears short and broad-winged. Distribution. 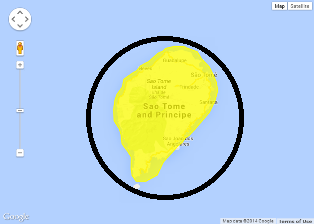 The Giant Weaver is restricted to Sao Tome (see map below, based on Handbook of the Birds of the World, Vol. 15). No subspecies of the Giant Weaver are recognised. 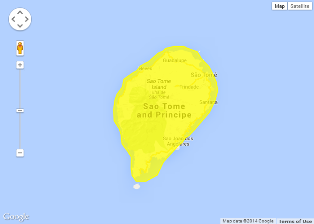 A century ago it occurred on Ilheu das Rolas, a small island south of Sao Tome, but is now extinct there. Habitat. The Giant Weaver inhabits natural forest, plantations (coffee, oil palm, coconut, bamboo, cocoa), and clumps of woodland. It is rare in savanna, and common in degraded habitats, especially in the lowlands. Food. The Giant Weaver feeds on grass seeds, crushed nuts of cocoa trees, fruit, and berries. It also feeds on insects like beetles, and even snails have been recorded. The Giant Weaver feeds at all levels in vegetation, and sometimes on the ground. It forages singly, in pairs and in small parties, but does not join mixed-species flocks. Breeding. The Giant Weaver is a monogamous, highly territorial, solitary nester. The male may beat his wings in perched display near the nest. The nest is a large untidy ball with no entrance tunnel. It is built with strips of palm leaves, and is supported below branches and well hidden. The nest is placed in palm or other tall trees. The clutch is 1-2 eggs, which are plain blue. Nothing else is known about its breeding cycle.